MoP beta testing is coming along and things are constantly being added, removed, and changed. Here are the most notable features discovered in the recent beta patches. 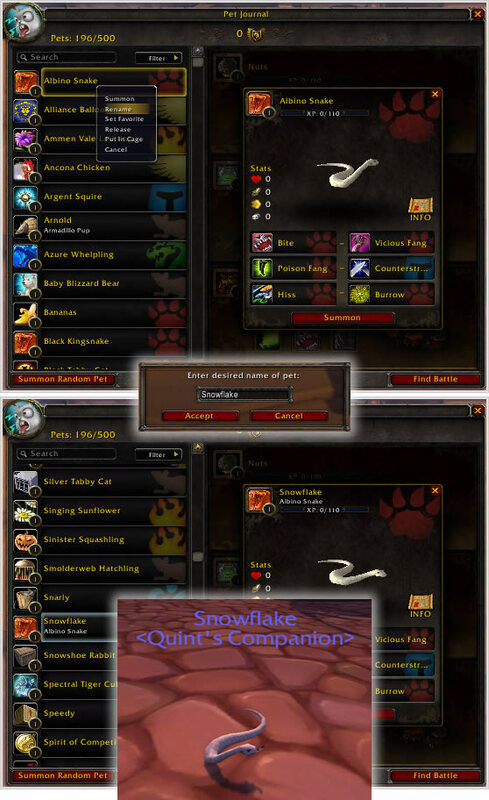 After much anticipation, the ability to rename pets is available for testing on the beta! Renaming a pet is straightforward, but it can only be accomplished using the Pet Journal. To rename a companion, right click on the pet's name in the Pet Journal and select the "rename" option in the drop-down menu. After confirming a new alias for the pet, the companion will show up under the new name in the Pet Journal (viewable by all characters). It will even sport its unique handle when summoned from the journal too! Don't be alarmed if the companion is not listed in the same spot prior to its renaming. Since the Pet Journal sorts alphabetically, it will relocate the pet using the name you gave it. Renaming a pet doesn't seem to impact or alter the spellbook version of the companion at the moment. When summoning the pet using the spellbook, it uses its default name and not the unique alias you've assigned it. It's not clear if this is intended or if this will change prior to the release of MoP. There are a few restrictions when it comes to naming your pets. Players cannot use inappropriate or flagged names, and special characters, such as the @ and # symbols, are also not allowed. Spaces and the capitalization of letters seems to work fine, though. Lastly, players are able to rename pets as many times as they wish, without penalty (for the time being). That being said, with potentially over 400 pets to collect in the expansion, better start brainstorming unique names for your pets sooner rather than later! One feature that we may have to wait a while longer for is pet trading and selling. The latest beta patch gave us the first preview of how this feature might work, but it's by no means fully implemented. 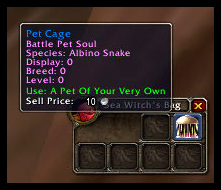 Players on the beta can currently put companions located in their Pet Journals into Pet Cages. Doing so removes the pet from the journal (on all characters), and places it inside a Pet Cage which will show up in your inventory. When hovering over the cage, it will show the name and level of the companion inside. Placing a companion into a cage and trading it to another player seems to have no effect on the pets found in your character's spellbook. We're not sure if this is intended or a bug as a result of the spellbook and Pet Journal acting as two independent collections. For a more detailed description of the pet cage in its current state, check out the Pet Cage Preview at Perks N Peeves. As a small warning for those participating in the beta: placing a pet into a cage at this time might result in being unable to add it back into your Pet Journal. This feature is obviously still not fully implemented, and there are many bugs and missing components. Pet trading and even renaming, as simple as it may seem, are still works in progress. There will be many updates in future beta patches. We look forward to testing it all out and bringing you the latest news, so stay tuned!